Would you make a good lyricist? Take our career test to find out how you match with this and over 800 other careers. What is the workplace of a Lyricist like? A lyricist is someone who is involved in writing creative words that are used in songs. Many times, a successful lyric writer will work closely with a musical composer who can give feedback on how the written lyrics will work in conjunction with the music that will accompany them. Sometimes a lyricist will be someone who can not only write the words to a song, but can also write the music. This is a definite advantage for any lyricist, because that way they are able to control both aspects of a song, ultimately achieving the artistic feel that they were aiming for. Even if a lyricist does not have the complete ability to write both the words and music-piece, it is an excellent idea if they are able to have a brief understanding of the musical aspect. 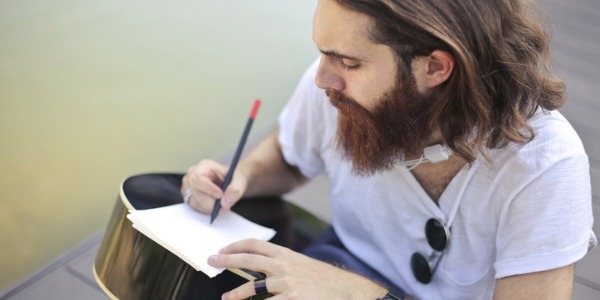 At times, a lyricist will write exclusively for one band or performer. 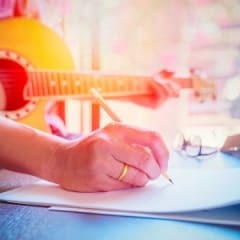 Many performers or entertainers do not write their own material, but are backed by talented writers who are able to compose songs that compliment their niche in the industry. Typically, a lyricist will be a freelance writer who submits their work to composers, record companies, or performers who are looking for words to put to the pieces of music they have written. It is not uncommon for a lyricist to have a musical recording submitted to him or her, and be asked to put together words to go along with it. It is important that a good lyricist be able to work well with other people. Often, the work of a lyricist is scrutinized and edited in order to come up with a finished product. Communication and people skills are a must if you are going to be working with other composers or writers. Sometimes a good lyricist is able to not only write the words to a song, but write the musical aspect as well, and perform it on their own. Some very successful artists and entertainers have mastered each aspect of song writing, and have gained wealth and notoriety because of it. Some excellent examples of this would be John Lennon, Fiona Apple, John Mayer, Elton John, and Jack Johnson (just to name a few). Are you suited to be a lyricist? Lyricists have distinct personalities. They tend to be artistic individuals, which means they’re creative, intuitive, sensitive, articulate, and expressive. They are unstructured, original, nonconforming, and innovative. Some of them are also enterprising, meaning they’re adventurous, ambitious, assertive, extroverted, energetic, enthusiastic, confident, and optimistic. Does this sound like you? Take our free career test to find out if becoming a lyricist is right for you. There is not a typical or standardized work environment for a lyric writer. As mentioned above, many lyricists are freelance writers, and many of them work from home. It is also possible to rent out a studio space or office suite where you have a dedicated work area. This may help your concentration, as well as your professionalism when meeting with possible clients. It may be difficult to afford a rented office space when first getting started, but it would be a good thing to keep in mind for the future.